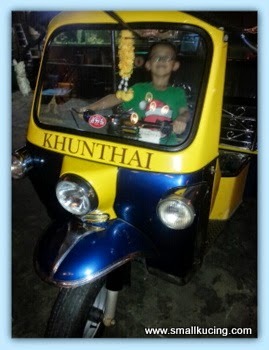 Come come...who wanna ride Tuk Tuk with me....? Yea.... we simply "sesat"(got lost) to here. Went to pick up a friend and on the way back we were looking for food to eat. 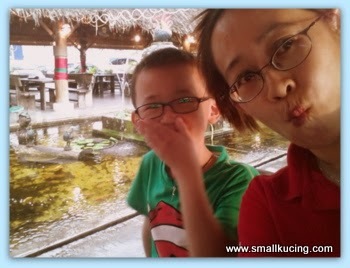 Mamarazzi recalled nearby there she saw signboard advertising Khunthai Restaurant so turn in lo. 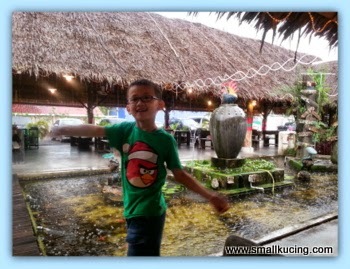 Adoi........small kampung road. Drove and drove and drove...no sight of the restaurant geh? Not sure how far the restaurant from the main road...Mamarazzi was going to ask Papa to urn back when we spotted sign of the restaurant. Too bad as we brought along the rain as we arrive at the restaurant, Would have been nice to sit outside to enjoy the lovely sunset. As the rain slow down, Mamarazzi and me went outside and snap some pics. Uh-Oh! Got gray hair la. Can I pull? Hyper liao while waiting for the food. I didn't feel hungry at all. The adult kerabu Chicken feet. Hmmm...maybe should give it glamour name Phoenix claws salad? It was the first time of our friend having this. Finished eating that. So means it's good enough la. Haiz.....Mamarazzi's time to be hyper pulak. Aiyak...forgotten the name for this Garlic Fried Chicken...something along the line of Messy Chicken or what. The waitress said taste very nice punya when she recommended this. Mamarazzi tasted...hmmm....normal la. Could be it was not marinated long enough. Suggest to marinate the meat longer so that it will have more taste. 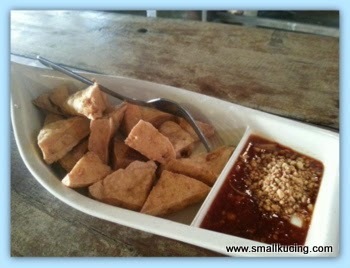 Also ordered the Fried Tauhu. Nice . Taste as good as the one in PJ . 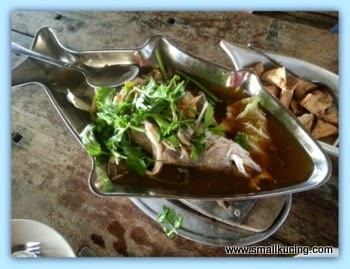 Last but not least, Thai Style Steam Fish. Mamarazi love it...especially the "soup". Even ask the lady to "refill" the soup after finishing . But one thing is that ...the longer the soup being heated under the charcoal burner...the more sour it become. In the end, Mamarazzi cannot finish the soup. But it tasted okay for Mamarazzi's friend who is pregnant. 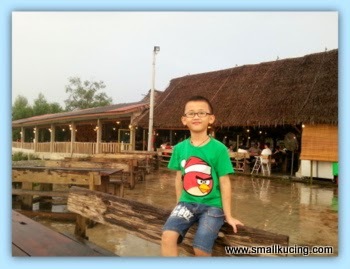 Overall, nice place to eat if you want to have good ambiance. Price wise...not so sure. It felt like slightly higher from the price charged in their PJ restaurant. But then it could be due to the seasonal price of the fish kot? Didn't have the detail bill coz Mamarazzi's friend, KH , was very fast when comes to paying. Thank you very much KH for the makan. Kampung Air Hitam, 6 1/2 Miles, Jalan Langat,, 41200, Klang, Selangor. Wah ... jalan jalan cari makan ! LOVE the pictures of you and your beautiful mom! 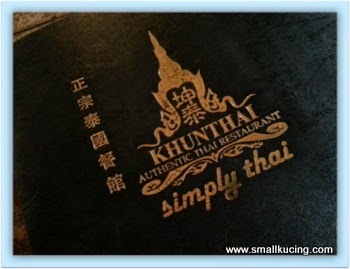 Go Khunthai la...their food is good. Got one in PJ. My my!!! You're getting bigger...and more and more handsome now! Sure lots of girls running after you in school. 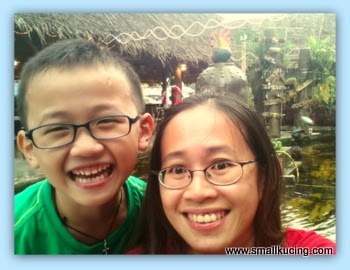 Che-che & auntie went to the one in Penang, I stayed back in Sibu...sobssssss - they said very nice but very expensive...and very crowded. Wah shopping in Penang ah? Next round, your mama try out cook the garlic fried chicken? Let your hair down Mama Kucing and enjoy to the fullest!! fuyoh, very adventurous hor?? 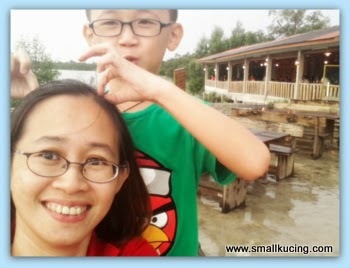 drove along the kampong road and then just drove and drove and drove.. luckily when about the turn back, Mamarazzi spotted the sign of the restaurant.. meaning this restaurant is deep inside a kampong with a very natural setting?? oh, the "Pheonix Claw" salad, haha!! maybe Mamarazzi should suggest that to them, but then maybe in Thai they already have a very glamorous name for this dish?? just googled, it's called "Yum Tien Gai", haha, so do you think this sounds glamor enough?? looks loaded and with lots of chili leh, just ordered this but didn't order the mango/papaya salad ke?? I enjoy Small Kucing and Mamarazzi hyper pulak photos very much. Just the mention of Thai food makes me hungry and forget about watching my diet..lol.. 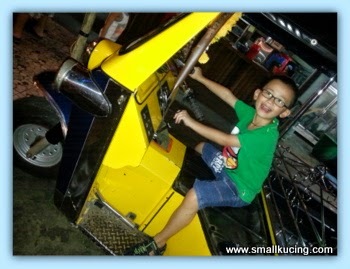 Very nice the photos of Small Kucing and Mamarazzi! The kucing family sure knows how to sniff for food. The kerabu is my fav and seem a good try too. Have not been to any of the Khuntai outlets here except for the one in Penang. Now the bell is ringing loud for another round of Thai food in this eatery. Hi there, Looks like a fun time... Your food looks really delicious... 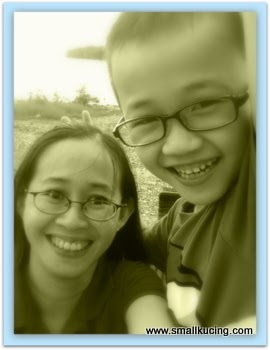 BUT--what I loved today were the Selfies between Mom and Son... TERRIFIC. 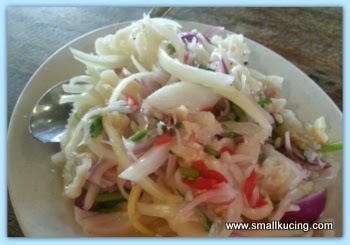 I am surprised there is a Khunthai restaurant in Klang too! Not sure whether same bosses but all seems to use attap roofs! I like the attap styled making the premise cosy. I wonder who is KH, so fast and generous one. I wish to have more friends like KH!!! Introduce to me please! Wah! I love the fried chicken and fried tauhu! So tasty and spicy. 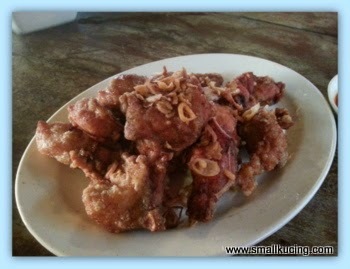 I bet you have tried the one at Jalan Gasing as you blogged once but what about the one in Kepong? Got people say the food tasted different cos different chefs! It made sense to my head suddenly. Kap! Eii...for a moment I thought u all were in Thailand. yes heard of it from Pete. You know they say... for every grey hair you pull, 10 more takes it place.